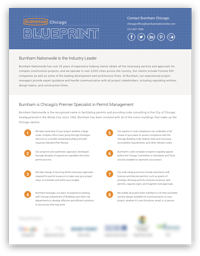 Burnham Nationwide is the recognized name in permit expediting and building code compliance consulting in the City of Chicago. 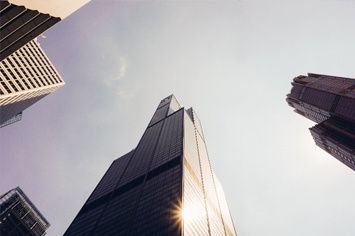 Headquartered in the Windy City since 1992, Burnham has been involved with all the iconic buildings that make up the Chicago skyline. We can assist with a project whether it is a complex office tower going through Developer Services or a smaller residential building remodel requiring Standard Plan Review. In addition to expediting all the building permits required for the entire lifecycle of a large-scale construction project, our permit expediters can help with permits and licenses such as grants of privilege, driveway permits, business licenses, tank permits, capacity signs, and magnetic lock approvals. 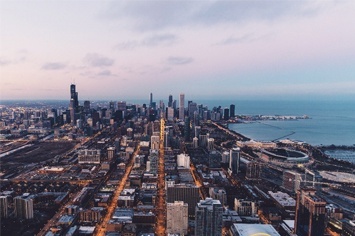 Our nationally recognized code consultants can undertake a full review of your plans to assure compliance with the Chicago Building Code, Chicago Energy Conservation Code, the Americans with Disabilities Act, state and municipal accessibility requirements, and other relevant codes. Burnham’s code compliance team regularly represents our clients before the Chicago Committee on Standards and Tests.